For most of your life, you’ve probably worked for your money. Retirement income is money that works for you. It includes any income from investments, pensions, annuities, royalties, and other forms of passive income. For most seniors, the amount of retirement income they receive depends on decisions made years, and even decades, earlier. A job that pays a pension, a relatively high wage that drives up Social Security earnings, careful investing, and employer contributions to retirement plans can all increase the value of your retirement income. Prepare for inflation and a long life. It’s easy to look at a growing nest egg and feel confident that all is well. But the value of that money in 10 years will be lower than it is today because of inflation. The average 65-year-old living in the United States today can expect to live 18-20 more years. If you’re lucky, you may live longer. Ensure you don’t outlive your investment. Get sound investment advice. Meet with a financial advisor now to assess your investments and whether now is the time to get more conservative or aggressive. Seniors who worry that they have not saved enough are often reluctant to meet with an advisor, fearing the worst. Yet this is one of the best reasons to seek advice. The right advisor can help you get your retirement income plan on track now. Max out 401(k) contributions and contributions to any employer matching plan. After the age of 50, you can make catch-up contributions to your retirement account. At 55, you can contribute more to your health savings account. Consider investing in long-term care insurance, particularly if your employer offers it as a perk. Plan for healthcare costs. Medicare won’t cover everything, so devise a strategy to ensure your health costs don’t drain your savings. A prescription drug plan, the right supplemental insurance, and even an employer-backed employee benefit plan can protect your income by slashing medical costs. A health savings account may also help protect your money. Reduce your spending. Money sitting in your retirement accounts is still working for you, earning interest. The moment you withdraw that money, you cut into your long-term income. So getting your spending under control allows your money to grow larger for longer. Develop a sustainable withdrawal plan. In an ideal world, you would withdraw less money than the percentage by which your investments grow. For most seniors, this is not realistic. The right advisor, however, can help you devise a withdrawal plan that greatly reduces the likelihood that you outlive your money. Protect your money with conservative investments. When you’re retired, you can’t afford to take as many risks. Some investment advisors recommend keeping at least some of your savings in cash. The standard advice is to keep a 50/50 mix of stocks and bonds. Be mindful of hidden investment fees. They might seem small, but these fees add up. Invest that money instead and watch it grow. Turning a hobby into a part-time job. Consider selling crafts on Etsy, participating in local makers’ fairs, or even teaching a class. Decluttering. Do you really need that closet full of baseball cards? Get rid of the stuff you don’t need and sell it on eBay or at antique markets or consignment shops. Consulting work. Can your old employer keep you on part-time or on an as-needed basis? Can you pick up some extra money as a freelancer? A part-time job. Some seniors enjoy working a day or two a week at a part-time job. Working at a bookstore, a boutique, or a baby store might not have been lucrative enough when you were working full-time. Now that you’re retired, however, a similar job might give you a chance to meet new people and do something you enjoy. 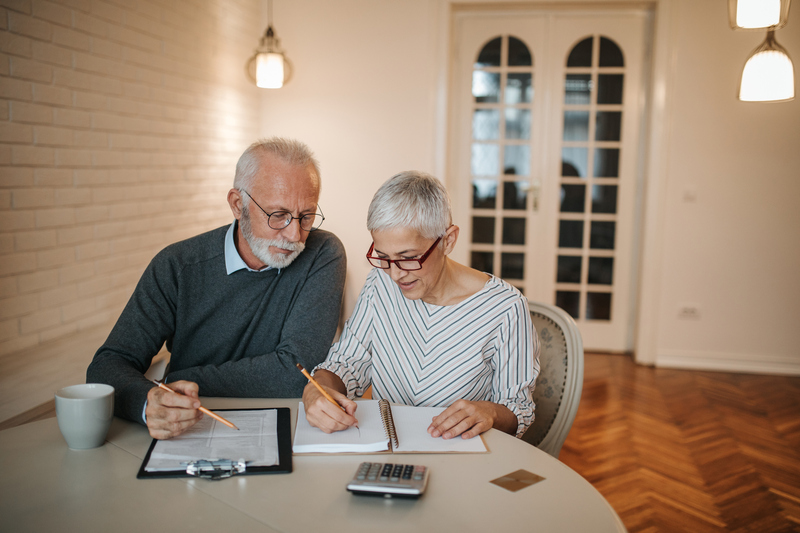 Retirement income may affect the value of your Social Security check, as well as your eligibility for pensions and other benefits. So talk to a retirement advisor about how to balance work with passive income and whether you need to limit the number of hours you work or the money you earn. Seniors are eligible for a number of tax deductions and tax breaks. In some states, seniors don’t have to pay state income taxes on Social Security income, and in a few states, they pay no income taxes at all. So if a move is in the cards, check out state tax laws before taking the plunge. The ability to deduct medical and dental expenses that exceed 10 percent of your adjusted gross income (AGI). This includes home care expenses, supplies such as dentures, and the cost of assisted living. Higher contribution limits to retirement accounts. These contributions may be tax-deductible. For example, a married couple can contribute up to $12,000 to an IRA, then claim it as a tax deduction. A higher standard deduction after the age of 65. A tax credit for those over 65. Unlike a deduction, a credit reduces the total amount you owe, and can even get you a refund. People who are under 65 and permanently disabled may also be eligible. Deductions for business expenses. If you start a consulting or hobby business, you can deduct all associated expenses, such as supplies, advertising, and postage. Tax breaks on Social Security income. Depending on how much you get in Social Security, you might not have to pay taxes on it. The exemption changes every year. In 2019, individuals with incomes below $24,000 do not have to pay taxes on Social Security earnings. For most people, housing costs comprise the largest portion of their budget. The average American spends about 25 percent of their income on housing costs. For people living in areas with high property values, the figure may be significantly higher. Even if you own your house outright and no longer pay a mortgage, the odds are good that housing expenses figure prominently in your budget. Unexpected expenses such as termite treatments, repairing a roof, and renovations can cost a pretty penny. So too can recurring expenses such as lawn care. Moving to senior living can save you time, money, and stress. With everything included, you won’t have to worry about landscaping, fixing the leaky roof, or upgrading furniture. You’ll have ready access to delicious and nourishing meals, a home you’ll want to show others, and the comfort that comes from living in a community. Many seniors are able to fund luxury senior living by selling their homes. Here, too, there are important tax benefits to consider. Individuals can earn up to $250,000 in profit from selling their homes while remaining exempt from capital gains taxes. Married couples filing jointly can profit up to $500,000 before capital gains taxes kick in. The Arbor Company has proudly served seniors for more than three decades. We believe that the next chapter of your life should be your best. We take the stress out of retirement so you can focus on sculpting the retirement of your dreams. Whether you want an adventurous second act filled with new skills and new romance or a quiet yet luxurious existence that ensures you have help when you need it, we can deliver. Let us show you the path to a better and more affordable retirement. To learn more about senior living and weigh potential costs, try our cost calculator tool.